EDT offers high-efficiency, reverse-flow cyclones for the main separation of airborne powder for dry particle collection or recovery. 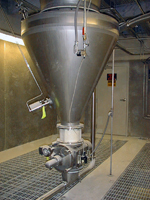 In spray dryer systems, particles entrained in the exhaust air leaving the drying chamber must be separated and recovered to prevent air pollution through powder emission to the atmosphere, and to achieve maximum output from the spray drying system. EDT reverse-flow dry cyclones are designed to operate under pressure or operate under vacuum. Powder and air enter the cyclone tangentially creating a spiral motion within the cyclone. The powder and air swirls in spiral form down to the base of the cyclone, separating the powder out at the cyclone walls. Powder exits the base of the cyclone while the clean air spirals upwards along the axis of the cyclone passing out the top. 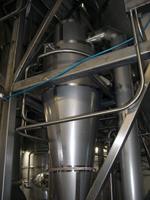 Further collection of fine particles before discharge to the atmosphere is achieved by secondary dry collection using a baghouse or secondary wet collection using a wet scrubber.